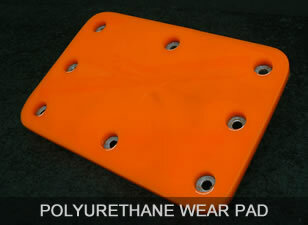 Polyurethane is a very versatile and extremely durable substance, hence its use in many different, often harsh, environments where components must be hard wearing and have a long life expectancy. However it is important to get the right 'mix' or compound, depending on the operating environment for the polyurethane component. Many different factors come to bear, such as (for wheels for example) – load levels, condition of floor surface, operating temperature, noise levels, frequency and/or duration of use etc. Forktyre supplies many clients where continued operation in harsh environments is expected, and we pride ourselves on having a reputation for manufacturing hard wearing and long lasting components. Please send through your designs and specifications for the equipment and/or product you need, alternatively contact us on 07 3209 8005 to arrange a meeting to discuss your needs or to arrange for us to visit your facility. Forktyre products are well known for their toughness, long life and durability. Don't compromise with your choice of polyurethane components – choose Forktyre.